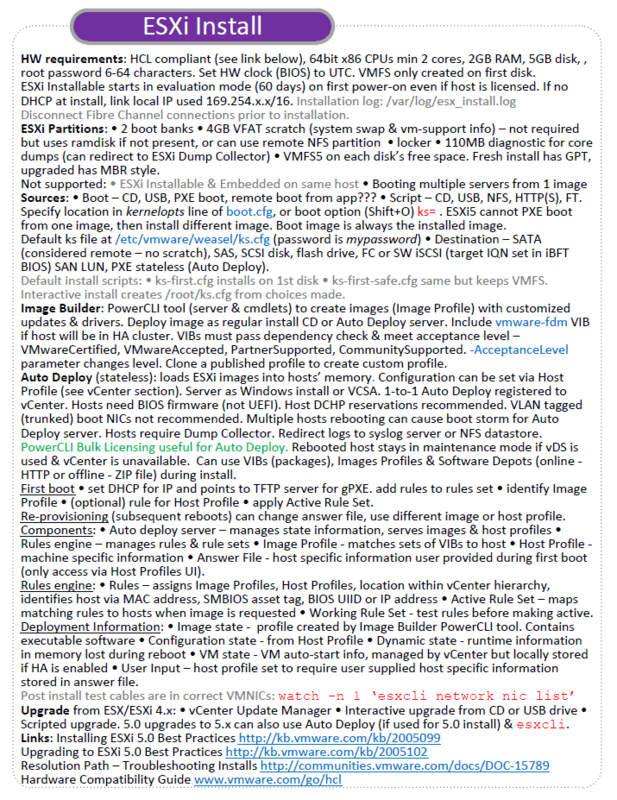 Here’s a preview of the Install section for ESXi 5 from the upcoming vSphere 5 vReference Card. I’ve gone fairly heavy on the Image Builder and Auto Deploy areas. Probably much more than they deserve in relation to their importance, but they are new and generally less understood so I thought I’d start in verbose mode. I can always pair it down before the section makes it into the card. Do you think it’s worthy information? I’d love to hear your feedback on the section’s content, as I’m likely to drop anything I can’t be sure is absolutely correct. Anything still in grey are areas I’ve not been able to confirm are still valid with vSphere 5. Just drop your comments below or catch me on twitter (@forbesguthrie). View/print it as a PDF here.